We're back from our RV trek down south to visit my mom and test out the new truck camper. Mom is physically much better in the two months she has been in the assisted living center. It is amazing what nutritious food prepared for you and served with no work on your part will do. She's gained some weight, is more stable and doesn't need the walker anymore. She's miserable being there but it is currently the best place for her. We took her out for most of 5-6 days doing fun tourist things and lots of family time. 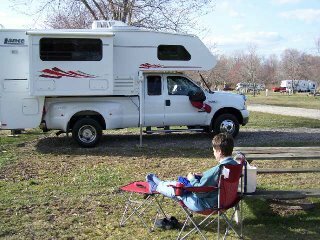 See the RV trip at http://otrafrommaine.blogspot.com/. I'm having problems posting photos to that site but will keep trying. Not a lot of knitting was done on the trip as we stayed so busy outside. Basically we ate supper and slept! I was able to get about six inches done on the body of FLAK and am pretty pleased on how it is coming. Don't like my bind off row on the neckline but didn't sew in the yarn tail so will get another chance at it. It just seems to roll too much - course it isn't blocked yet either. I added a braid and two side honeycombs down the center on each side under the underarm. It's so much fun just playing with design on this FLAK. I cannot wait until I start the next one after I work my way through Janet's new book. Took the book on the trip also but it's a heavy book and I hit myself in the face a couple of times going to sleep while trying to read it - snooze! I took the SFC Fair Isle Shirt Tail Hem sweater with me also but never got but about 5 rows done. No way could I knit that one, watch the scenery and follow a chart at the same time. I could knit on FLAK as the cables are easy to memorize. Now that we are home and there is a week of rain coming that will keep us out of the perennial garden cleanup, I should get back to both projects. 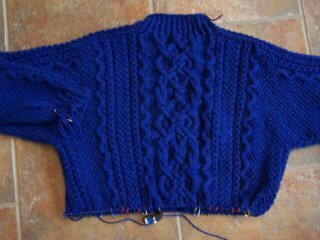 Poor Spring Forward sweater is a distant third at the moment, but will be finished.